Each device we have chosen to develop is targeted at specific generic product opportunities. Our deep understanding of the marketed devices allows us to design novel internal mechanisms that give us control over the drug delivery performance. Our human factors and industrial design processes ensure that each device has a substitutable user interface. The platforms are designed to also be adaptable for NCE and PLM applications. Our pMDI actuators can be configured for oral and nasal delivery. Each device features our proprietary dose-counting technology which offers a high-clarity, front-mounted display with low component count. The counters can be configured for common inhaler capacities e.g. 200-dose and 120-dose. The display shows the specific number of actuations remaining, and clearly signals to the user when there is a low number of actuations remaining via the low-dose indicator. The system for indexing the digits has been engineered to ensure high count accuracy that minimises the risk of undercounting – “fire-not-count” – and can be configured to work with a range of commercially valve/canister combinations. The valve sump can also be configured to allow us to match the spray pattern and aerodynamic particle size distribution of marketed products. A well-known issue with the pMDI format is incorrect use, which can lead to poor compliance. Some users find it difficult to depress the canister at the right time during inhalation and consequently may not receive the correct dose. One way of solving this problem is with breath-actuation. A breath-actuated inhaler senses the patient’s inhalation and automatically releases the dose at the right time. Our BAI has been developed with a specific generic product in mind. However, our novel internal breath-actuation mechanism and dose-by-dose counter provide us with the flexibility to control certain parameters e.g. pre-trigger resistance, trigger flow rate, spray pattern etc. 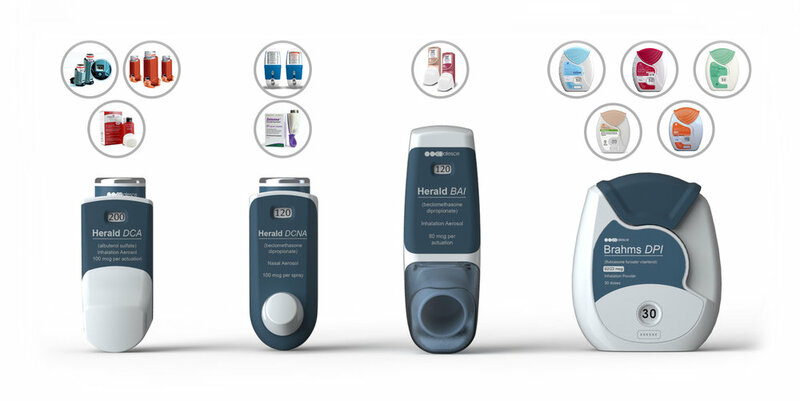 Our dry powder inhaler features an open-inhale-close user interface, a proprietary dose counter, and a novel mechanism that can deliver 30 pre-metered doses of one formulation, and 30 pre-metered doses of a second formulation, simultaneously. Using state-of-the-art modelling techniques, including CFD, we have developed early prototypes which have demonstrated in-vitro equivalence with a marketed combination therapy when tested in our analytical laboratory.